When I posted this outfit on Instagram and my other social media platforms a week ago, little did I know it was going to receive so much love and become an instant favorite. Thank you all so much. I immediately knew I had no choice but to share it on the blog soon. It was an outfit I had put together one of those days it seemed like it just rained from sunrise to sunset. I refused to stop. After being so bored staying in all day, I finally stepped out of the house for some air. Unfortunately, the rain stopped for what seemed like a second because shortly after, it continued again. Luckily I managed to get a few shots of my outfit right by this building. I am really not sure what that building is but it is a pretty awesome backdrop for outfits and photography. It is right across from along Sugar Beach in Toronto. Since I needed a fix to lift such a gloomy day, I paired the orange beaded necklace with the yellow dress, cinched on the waist with a thin black belt and threw on a pair of animal print heels as a pop. And tadaah! It seemed like I felt a rain drop on my arm but I panicked it may have been bird poop. Eeek! Beautiful dress!! You have such nice legs!!! This is your colour and I also love the backdrop! Such a Great color on you. Such a cute dress. You look amazing. I often pick yellow on rainy days because this colour makes me feel more positive! I really like your yellow skater dress, you totally have the figure for it. The orange necklace and leo pumps are a great accessories for this bold and beautiful styling. The building proved to be a lovely neutral location...and made this look stand out even more. Have a lovely day, my gorgeous friend! Yellow is your color Busola, you look smashing!!!! Amazing look! Love the dress and your very beautiful! Such a gorgeous dress Busola! And you look amazing as always! 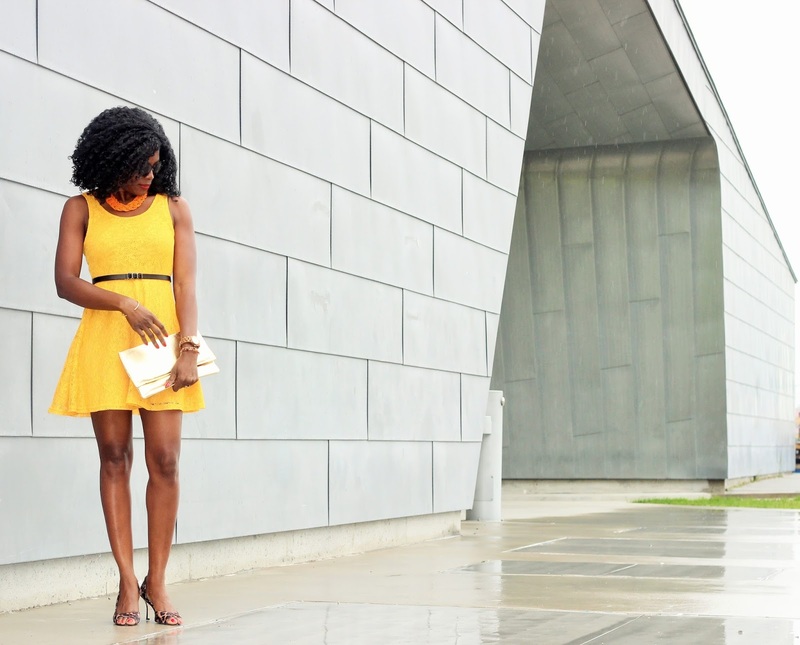 I love the color blog of Yellow and orange and the whole look is a a summer perfection! Gorgeous in yellow. Every color looks great on you. I love how basic this dress is! The styling opportunities are endless!